What do you do when a shipping route goes around a treacherous, rocky peninsular battered by frequent storms? If you are Norway’s Coastal Administration, you build a short cut that goes underground. Norway has unveiled plans to build the world’s first ship tunnel by blasting through 7.5 million tons of rock on the Stad peninsula. The tunnel will be over a mile-long, 118 ft wide and 150 ft tall, it will pass through the narrowest part of the Stad peninsula in western Norway, allowing freight and passenger ships to bypass the stormy, exposed Stadhavet Sea and avoid a highly treacherous part of the Scandinavian nation’s coastline. “The Krakenes lighthouse, just south of Stad, is the meteorological weather station with the most stormy days, which can be anything from 45 to 106 days per year,” says the Norwegian Coastal Administration, which announced the project Wednesday. “The combination of wind, currents and waves around this part of the coastline make this section a particularly demanding part of the Norwegian coast,” the administration says. It says it hopes the tunnel will improve safety and stop ships from having to wait for bad weather to pass. Passages and canals for boats have been built elsewhere in the world, but this will be the first tunnel allowing enormous cruise and freight ships that weigh up to 16,000 tons to pass through a solid rock tunnel. To create it engineers will have to blast out 7.5 million tons of rock. If you’re wondering what might happen if two ships come nose-to-nose, it’s unlikely, because there will be traffic lights. “We are going to follow the usual standard with red and white lights to show when it is safe to pass,” the team says. The tunnel has been recreated virtually and tested in a simulator. This article was first published on Supply Chain 24/7. 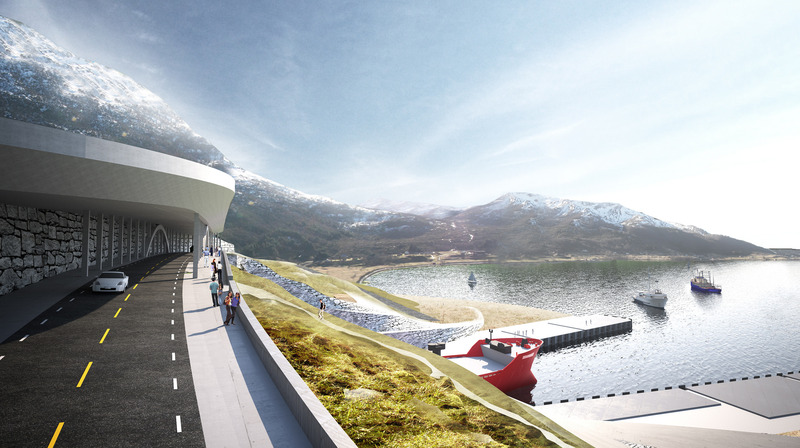 Images courtesy of Norwegian Coastal Administration/Snøhetta.